2017 has been an important year for QSC's evolution in the professional AV marketplace. The company is strategically embracing software-centric conferencing solutions and mainstream server hardware, technology that reflects enterprise-grade IT environments. The company’s Q-SYS platform, for example, uses Intel processing, Linux operating system services, and IEEE networking protocols. The fourth-generation Q-SYS operating system now runs on the Dell EMC PowerEdge R730 server. What’s more, strategic alliances developed by QSC this year deepen the integration between companies like Shure, Logitech, Attero Tech, Audinate, Atlona, and d&b, illustrating a broad portfolio of third-party integration devices for the Q-SYS ecosystem. Yesterday, the industry learned of a new technical partnership between QSC and WyreStorm enabling the two distinct technologies to integrate WyreStorm's NetworkHD video over IP distribution with the Q-SYS platform. “The shift from dedicated hardware to centrally deployed software solutions for video, audio, and control systems makes perfect sense,” Saar Litman, senior analyst at Wainhouse Research, explained in a 2017 statement. “Today’s AV managers work within the IT department, and they expect solutions that behave like IT solutions in terms of scalability, extensibility, manageability, and integration with existing IT tools." 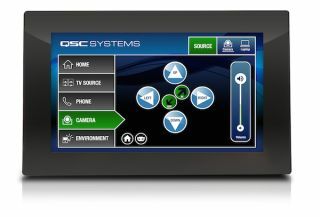 This week, QSC expanded its control offerings even further with the introduction of the new TSC-47W-G2, a 4.7-inch in-wall touch screen dialer/controller. The model combines capacitive LCD touch technology for intuitive interaction with a 960 x 540 HD display. Its inclusion of Power over Ethernet (PoE) allows for single cable installation. The TSC-47W-G2 can operate in portrait or landscape mode for installation on a wall, lectern, or other flat surface. In addition, these units include accessories for mounting to US and European standard wall and junction boxes. The company added that, as with all Q-SYS touch screens, AV professionals can easily create custom graphical user control interfaces for the TSC-47W-G2 directly within Q-SYS Designer Software. Echoing a broader trend, the drag-and-drop configuration allows AV pros access to the full range of controls, from complete systems control and monitoring to one-touch deployments of complex presets. "TSC-47W-G2, accompanied with the capabilities of the Q-SYS control engine, create a powerful and affordable solution for comprehensive QSC and third-party device control for meeting rooms to theme parks,” Brandes added. "Q-SYS is a one-stop-shop for audio, video and control, and it eliminates the need for additional hardware." Q-SYS Level One training now offers new tutorials to help design an intuitive and functional user control.